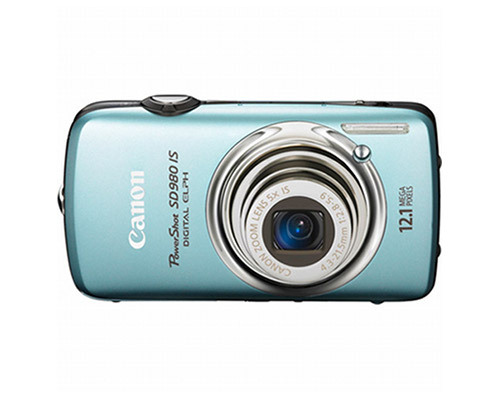 The Canon PowerShot SD980 is a point and shoot consumer digicam with a touch-screen and HDMI support. It is also a redesign of the PowerShot SD960, offering larger (and better) shots and a good value camera. The camera measures 3.9" by 2.1" by .9" and weighs 5.3 ounces, making it consistent with other digicams in its size and price range. The camera captures images using a 12.1 Megapixel, 1/2.3" type Charge Coupled Device. It has a total pixel size of 12.4 Megapixels. It also has a 4x Digital, 5x Optical, and 20x Combined zoom with an optical image stabilizer system. The camera has a focal length of between 4.3 (W) and 21.5 (T) mm, with a range of f/2.8 and f/5.9, equivalent to a 35 mm camera with a focal length of 24 (W) and 120 (T) mm. Its focusing range is between 1.6' and infinity and 2.9' (T) in normal focus, 2" and 1.6' (W) in macro, and 2" and 3.9' (W) in digital macro. It also includes an automatic TTL autofocus system. The camera has a maximum aperture of between f/2.8 (W) and f/5.9 (T) and a shutter speed of between 1/3000 and 15 seconds. Its sensitivity can be set into an automatic mode, but can also be configured to ISO 80, 100, 200, 400, 800, and 1600 equivalent if desired. Its light metering method is evaluative, but can also be set to a center-weighted average and spot settings. The camera has an exposure control method that can be set to program auto exposure, i-Contrast, and AE lock, as well as exposure compensation between -2 and +2 stops in 1/3 stop increments. White balance control can be set to automatic, but also to several presets (Daylight, Cloudy, Tungsten, Fluorescent, Fluorescent H) and custom settings. Its built-in flash can be set automatically, but also to red-eye reduction, auto red-eye correction, flash on, flash off, FE lock, and slow synchro. Its range is between 1.6 and 11' (W) and 2.9 to 4.9' (T). Its recycling time is 10 seconds or less and it offers no flash exposure compensation. The camera has many shooting modes. It can be configured to shoot automatically, but also to P, Portrait, Foliage, Snow, Beach, Sunset, Fireworks, Aquarium, ISO 3200, Indoor, Kids & Pets, Night Snapshot), Color Accent, Color Swap, Digital Macro, Stitch Assist, Long Shutter, Creative Light Effects, and Movie. The camera has many photo effect settings, including Colors Off, Vivid, Vivid Blue, Vivid Green, Vivid Red, Neutral, Sepia, Black & White, Positive Film, Lighter Skin Tone, Darker Skin Tone, and Custom Color settings. The camera has a 2-10 second self-timer that can function from custom settings or through face detection. Wireless control, like on most point and shoots, is not available, though the camera does offer continuous shooting at up to .8 frames per second. The camera connects via USB 2.0 and compresses JPEG images using Exif 2.2 and movies using the MOV format and the H.264 format for image and Linear PCM format for audio compression. It can save images to SD/SDHC Memory Cards, MultiMediaCard, MMCPlus Card, and HC MMCplus Card media. It captures images at resolutions between 640 by 480 and 4000 by 3000 and movies between 320 by 240 and 1280 by 720 (HD), though capturing images in HD reduces the amount of recording time from 60 minutes to 20 minutes on a 4GB media card. The camera also includes an NTSC/PAL-compatible video out, mono audio out, and PictBridge compatibility to enable direct printing to printers. It gets power from a rechargeable lithium-ion battery rated at approximately 240 shots or 360 minutes of playback time and can be charged via an external AC adapter kit. The camera has a 3" TFT color LCD that doubles as a touchscreen. Its LCD has approximately 230000 dots and 100% coverage. The touchscreen is the predominant means by which one controls the camera, making it unpleasant and frustrating for touchscreen-intolerant users. Few accessories are available for the camera, as this is a consumer-grade point and shoot digicam. Canon offers a leather case, additional battery packs, an AC adapter kit, mini-HDMI cables, and a high-power flash with a maximum distance of 23' at ISO 100, f/2.8.